Derek Kief - Class of 2014 - Wide Receiver: The Best of Cincinnati Issue of City Beat Named WR Derek Kief, "Best Super-Tall Local Football Recruit"
The Best of Cincinnati Issue of City Beat Named WR Derek Kief, "Best Super-Tall Local Football Recruit"
The Best of Cincinnati issue of City Beat compiles the best Eats, Shops & Services, Arts & Nightlife, Public Eye, Jocks and Urban Life in the Cincinnati area. "LaSalle junior wide receiver Derek Kief is one of the most sought-after high school football players in the country. He has a website dedicated to his recruitment, which recently noted that he’s among only four players in Ohio to receive offers from both Ohio State and the University of Alabama (one of them spurned both powerhouses and went to Michigan — ouch!). The 6-foot-5 Kief still has one year left at LaSalle before entering the college game in 2014. derekkief.com." 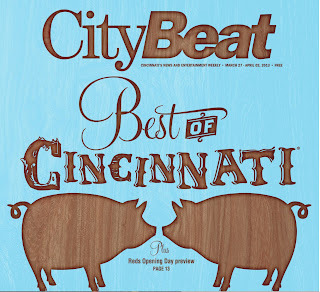 Thank you City Beat. Not only is this award an honor for Derek Kief, you sure gave us a laugh with the title!